Asafetida is the gummy dried juice of a large Asiatic perennial plant; its large, bristly, fleshy root produces a stem from 6-10 feet high, with alternate, pinnately decompound leaves on wide, sheathing petioles. The pale greenish-yellow flowers grow at the top of the stem in clusters of compound, many-rayed umbels. Found in Turkestan, Afghanistan, and Iran. Grows wild in central United States. As its name suggests, asafetida has a fetid smell and a nauseating taste; characteristics that also burdened it with the name devil’s dung. In the Middle Ages, a small piece of the gum was worn around the neck to ward off disease. Whatever effectiveness it had was probably due to the antisocial properties of the amulet rather than any medicinal virtue. Surprisingly, in Persia asafetida was used as a condiment and called the “food of the gods”. This herb is the major component in the famous Ayurvedic herbal formula Hingashtak, Sanskrit name is hing. Asafetida is also derived from another species of ferula (F. assa-foetida) which grows in Iran and West Afghanistan. In Persia this herb is so highly esteemed as a condiment, it is mixed with almost all their dishes. French gastronomers rub a little asafetida on hot plates from which they eat beef steaks. The distinctive flavor of Worcestershire sauce is obtained by the addition of this gum. When used with discretion, it adds character to curries, stews, gravies, etc. Skillful manipulation has made asafetida a useful ingredient in fine perfumes. It is still regarded a valuable medicinal in Europe, Near and Far East. As a condiment, it is recommended only to the hearty and the brave. In June the roots of 4-year-old plants which have not flowered, are cut to collect the milky juice. 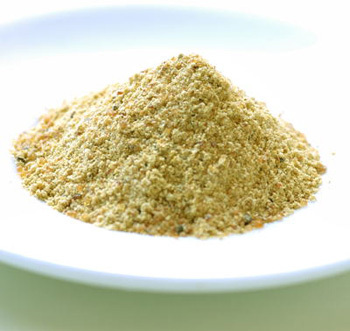 This dries to a brownish, gummy substance which is divided into lumps or powdered. Put in an air-tight jar or the kitchen will reek the sulphurous odor. Powder: because of its nauseating taste, it is usually taken in pills.